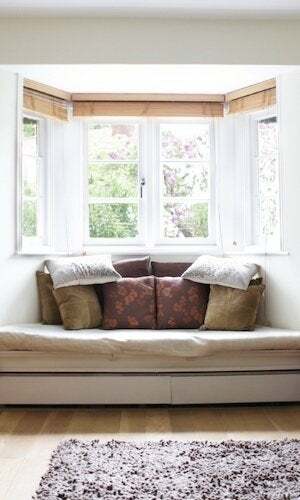 To capture views, sunshine, and refreshing breezes, there may be no more attractive option than a bay window. Take a few minutes to learn more about the benefits of this distinctive style. When bay windows first rose to prominence in America, back during the Victorian era, they were relatively common but not ubiquitous. Now, more than a century later, they are truly everywhere, having become a much-beloved feature of homes throughout the United States. Comprising three individual windows—one parallel to the exterior wall, with flanking windows that angle off to the sides—the design truly stands out, not only for its beauty but also for its practical advantage of affording an exposure on three sides. That one key factor enables bay windows to deliver all the benefits of a regular casement or double-hung, only “to a much greater degree,” says Jim Eldredge, a product manager with Sears Home Services. As he notes, “it’s easy to understand their tremendous popularity.” Bay windows “give homeowners exactly what homeowners want”—that is, light, bright, and airy living spaces. Indeed, perhaps more than any other type of window, a bay window can alter your experience of an interior, both improving how the space looks and transforming how it feels. To make your home seem bigger than it really is while forging a strong visual connection with the outdoors, there may be no better choice than this long-standing favorite. Thanks to their three-part design, bay windows maximize natural light as the sun charts its course in the sky. “The same can’t be said for a casement or a double-hung,” says Eldredge. After all, single-exposure windows admit peak sunshine at only one time of day. Bay windows, on the other hand, remain brighter for longer, thanks to their three-side exposure. Still, as desirable as natural light may be, there’s a point at which it becomes a liability. For instance, there’s solar heat gain, in which the beating sun slowly but considerably warms the home, requiring the HVAC system to consume more energy to maintain a comfortable temperature. Fortunately, quality replacement windows now come well equipped to combat the heat-gain phenomenon. Take, for instance, the Energy Star-rated WeatherBeater brand, exclusive to Sears Home Services. 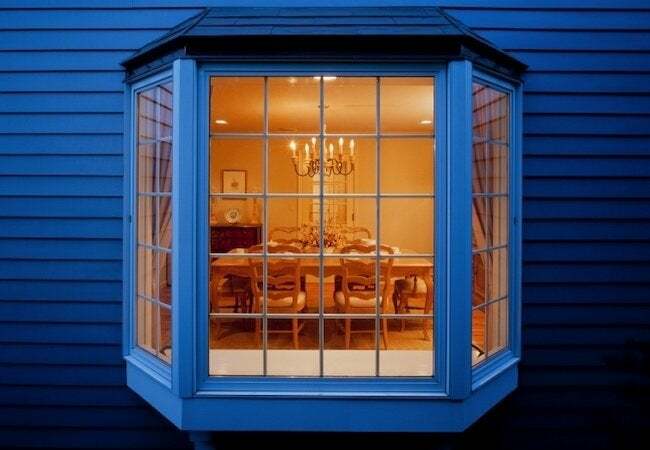 Double-paned, with insulating argon gas injected between the panes, WeatherBeater windows help to minimize solar heat gain and, in the winter, heat loss. In fact, the WeatherBeater line offers insulation that’s more akin to that of a wall than a traditional single-pane window. Just as they do in any other building product category, homeowners today have a wide selection of windows to choose from. Particularly given the potential that bay windows pose for increasing energy costs, “it’s critical to choose wisely,” Eldredge says. A typical bay window features a fixed panel in the center with operable windows on either side. When both side windows are open, the arrangement allows for refreshing cross ventilation. By channeling breezes into the home and sending warmer, dustier air outdoors, cross ventilation helps to create a comfortable, healthy indoor environment. For the strategy to be successful over the long term, however, Eldredge points out that the bay window must be built to last. To that end, he advises homeowners to look for models that “deliver first-rate performance without requiring much in return.” Aluminum-frame bay windows, Eldredge continues, “offer easy care at low cost,” but there’s a catch: As it’s highly conductive, aluminum does not insulate as well as other materials. Wood, meanwhile, needs to be refinished, whether painted or stained, every three to five years. “Only vinyl offers the best of both worlds,” Eldredge says. The Sears Home Services WeatherBeater line, for instance, demands nothing more than occasional cleaning, a task made easy by the windows’ tilt-in sashes, which allow hassle-free access to the exterior glass. Because they resist many of the challenges that compromise other types of windows, vinyl may be your best bet, according to Eldredge, if you want to benefit from a bay window but don’t want to devote time and energy to its maintenance. Intrigued? Before you leap into an ambitious DIY project, bear in mind that while this project may be within the reach of a skilled, experienced subset of homeowners, for everyone else, it’s a job best left to the experts. Whichever route you choose, though, you may at the very least need guidance. To discuss the project with a trained pro, seek out a contractor in your area or go online now to schedule a free in-home consultation with Sears Home Services. A generations-old company with a national reputation, Sears can help smooth what might otherwise be a complex, intimidating process. Plus, unlike most local outfits, Sears Home Services backs up its work with a Satisfaction Guarantee. This provides not only peace of mind, but assurance that, from the earliest planning stages to final installation—even after the workers have completed the job, packed up their tools, and left—Sears remains committed to the lasting success of your project.